The advanced Match/Action system provides developers with the ability to create complex, multi-state matches for USB 2.0. When a match occurs, the match unit can have one or more defined actions such as trigger the capture, assert external output, filter out the matching data, or go to another state. The fundamental building block of the advanced match/action system is a match unit. There six matches available for the user: four data matches, one event match, and one timer match. A USB 2.0 data match unit can match specific packet types and/or patterns with optional matching prefix (IN, OUT, or SETUP) and handshake (ACK, NAK, NYET, etc.) parameters. An event match unit can match bus events such as digital inputs. Lastly, a timer match will match after a set interval of time. Match units also have built in counters that can control when an action occurs. The advanced matching system provides the user with up to 8 states, with each state defining one or more match units. Unlike other analyzers on the market, the states are non-sequential and can even be defined to go to itself. 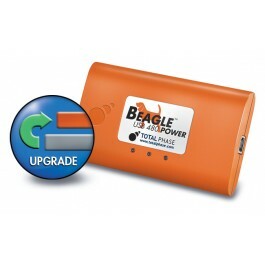 This flexibility allows the user to build a state machine to track USB 2.0 behavior with the Beagle USB 480 Power analyzer. Additionally, the order of match units is significant because if multiple matches occur at the same time, priority is given to the action of the first match unit. The Data Match Configuration for a Packet type enables users to match on specific PIDs, data patterns, data properties, and CRC conditions for USB 2.0. Additionally, a packet prefix and handshake can be selected to indicate a desired matching transaction on the bus.